After three days of lowball poker, standing pat and smooth eights we finally have a Champion in Event #14: $1,500 2-7 Draw Lowball! 250 players began this event with reigning Champion Phil Ivey and five-time lowball bracelet holder Billy Baxter the hot picks to make a deep run. Unfortunately for them, along with some great lowball tournament players, they would fall to the rail along with 183 others to leave 67 still in contention for day two. Nick Binger was the overnight chip leader and stayed on top throughout the day as play was fast and furious with players falling left, right and center until Ted Forrest and Shunjiro Uchida became our joint bubble boys. Sigi Stockinger (25th), Jose-Luis Velador (24th), Tommy Hang (21st), Chris Viox (18th), JC Tran (15th), Erik Seidel (14th), Chris Bjorin (13th), Scott Seiver (12th), Bryan Micon (11th) and David 'Chino' Rheem (9th) were some of the incredibly talented players that had a crack at making the final table, but inevitably fell just shy as a final seven would be formed following the elimination of Daniel Nicewander. Binger took the chip lead into the final table as play began with three players not in their seats. Unfortunately for Alexander Kravchenko he arrived a little too early as he bit the dust drawing to a nine-eight perfect. James Bord fell next when he broke a six-high straight only to pair up as Todd Bui hit the rail in fifth place when he was unable to improve his ten-six low. With Mike Wattel and Yan Chen well distanced on the leaderboard, play four-handed would see-saw back and forth between all the remaining players until Derric Haynie's pat nine-eight was unable to best Wattel's pat eight-six as he exited in third place. Sadly for Binger he was unable to improve on his previous WSOP final table by falling in third place drawing to a seven-wheel as two of the most experienced players on the table reached heads-up play. Chen took a slight lead into his expected intense battle with Wattel, and after an hour of play neither could be separated as we broke for dinner. Returning with some new found energy both players exchanged three-bet after three-bet until Chen slowly started to increase his lead against Wattel who was looking to add bracelet number two to his twenty-three cashes. 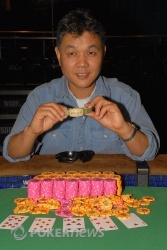 Inevitably Chen would prove the victor when his pat ten-eight was too strong for Wattel's pat queen-jack as the Las Vegas native captured his first coveted gold WSOP bracelet, $92,817 in prize money and title of Event #14 Champion! Congratulations to Yan Chen who displayed a great deal of composure and patience mixed with timely aggression and a friendly attitude to his opponents throughout Event #14 to deservingly be crowned Champion! Event #14 Champion Yan Chen! Mike Wattel Eliminated in 2nd Place ($57,375); Yan Chen Wins! Yan Chen entered the pot with a raise to 24,000 only to have Mike Wattel move all in for 98,000. Chen took his time shuffling chips between his hands before sliding a stack in to make the call. Both players stood pat with Wattel tabling his , but it would be Chen's that would be the victorious hand as Wattel hits the rail in 2nd place for a $57,375. There were eight hands in a row that were either walks or raise-and-take-its. Then on the ninth hand, Mike Wattel moved all in from the button for around 80,000. "All of a sudden?" asked Chen? Wattel laughed, and Chen folded. Mike Wattel entered the pot with a raise to 25,000 and Yan Chen made the call from the big blind. Both players drew one and checked the action as Chen tabled his . Wattel picked up his hand and spread it between both before showing his and then his drawn . As Chen closes in on one million in chips - 990,000 to be exact - Wattel slips to just 135,000. After some bigger action than we're used to in this heads-up match, things are getting back to normal. First Mike Wattel and Yan Chen traded walks. Then Wattel raised to 25,000, and Chen called. Both drew one, and when Chen bet 45,000, Wattel folded. The next hand, Chen raised to 24,000, and Wattel moved all in. Chen isn't ready to play for all the chips yet, and he folded instantly. Mike Wattel opened to 25,000 and Yan Chen made the call from the big blind. Both players drew two cards and checked. "Pair of fours" announced Chen as Wattel quickly tabled his pair of along with his to take down the pot and climb back to 175,000. 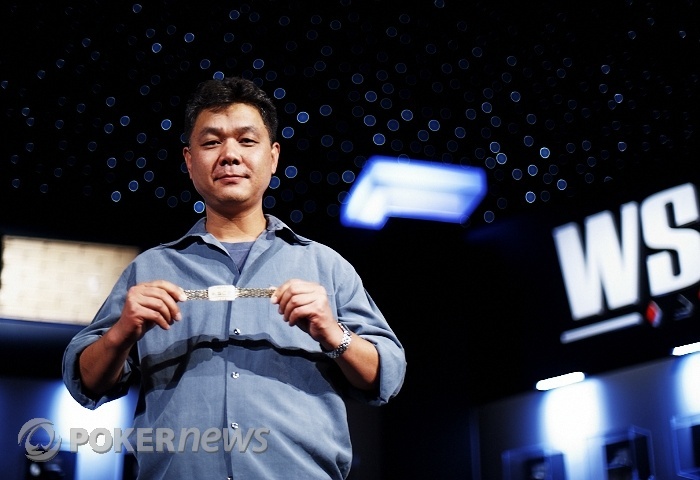 Chen however still has a commanding 950,000 in chips. Mike Wattel really, really needed to win one. He has is last T5,000 pink chips in the middle to pay his blind, leaving only orange T1,000s in his stack. Yan Chen raised to 24,000, and Wattel called in 24 orange chips. Wattel drew one, and Chen thought for a minute before discarding two. Wattel bet out 40,000. "Good bet," Chen said as he folded. 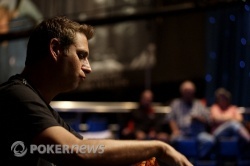 Wattel tried to keep the momentum going and raised to 25,000 the next hand. Chen called, and each drew one. Chen fired 35,000, and Wattel didn't know what to do. He counted out a call at least ten times, shuffling the chips back together each time. Finally, he pulled the trigger and tossed them toward the middle. "Jack," Chen said, showing . Wattel just shook his head and mucked. Wattel fell to 120,000 while Chen is up to 980,000.